Come join us for a fun evening of music, the film, and Q&A with filmmaker Christine Funk and Bluegrass musician Peter Rowan, who will be performing with Manose Singh, a Bansuri flautist from Nepal. There are only a few Blue Grass Boys still around that played with the Father of Bluegrass, Bill Monroe. Peter Rowan was a Blue Grass Boy in the 1960s for only a short time, but Bill's influence and musical knowledge still resonates with Peter. 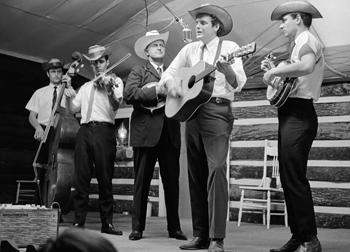 Even as he branched out into his own music after leaving Bill's band, his bluegrass roots were never far away. This portrait of Peter expands beyond his music to his artistic and spiritual endeavors spanning four decades, giving the viewer an in-depth look at a true legend within our Americana musical history. His lyrical quality and melodies are memorable, and Peter influenced the next generation of musicians, sharing what Monroe taught him and what he has learned while being a troubadour and traveling the world. Since the day I worked as an intern during college on a morning show I realized I liked the team player aspect to filmmaking and production work. I moved forward with my career as a production assistant on various TV movies and then as a production coordinator on several movies in Portland, Oregon. I moved to San Francisco to produce several Infomercials for the famous Temper-Pedic brand. In between my film projects I grew to love my visits to Colorado and decided to lived part-time in Creede, Colorado.